We’ve published a number of refugee memoirs, and they’ve always provided an incredible insight into the lives of those who flee to Australia, with the individual stories and suffering of ‘boat people’ otherwise rarely reported in the media. 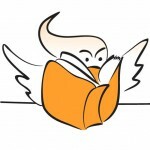 From the hugely popular memoir of Anh Do (The Happiest Refugee), telling Anh’s incredible journey from tragedy to comedy, to more recent stories from newsreader Tracy Vo (Small Bamboo) and comedian Sami Shah (I, Migrant) they have mainly been about those who’ve made it into the public eye in this country from a difficult background. This month, it is almost the opposite, as the incredible story of Dr Munjed Al Muderis places this modest man in the public eye on the back of his inspirational achievements. 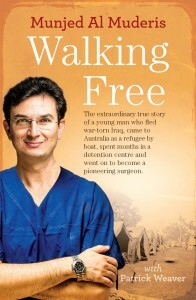 Munjed was an asylum seeker to Australia, fleeing certain death in Iraq for refusing to cut off the ears of deserters from Saddam Hussein’s army. He survived the journey to Australia with people smugglers, and the leaky boat that landed him on Christmas Island and then in Curtin detention centre. After being granted asylum, he worked incredibly hard to re-acquire his medical qualifications, and is now a world leading authority on osseointegration surgery – integrating artificial limbs into the bodies of amputees, many of whom served in Iraq. He refused a decree by Saddam Hussein to amputate the ears of Iraqi draft evaders, and wound up on a rickety boat to Australia. Now Dr Munjed Al Muderis is a pioneering surgeon giving amputees the ability to walk. They also produced this short video interview with Munjed. Munjed has also been on Radio National Breakfast, where he explained his escape from Iraq and the people smuggling that got him aboard a ship for Christmas Island. He also talks about his time in Curtin Detention Centre, with Munjed saying that prison is heaven in comparison to Australia’s detention centres, and while he is in favour of them says they need to be humane. Listen to that interview below. Munjed explains osseointegration, his escape from Iraq and Saddam Hussein, and how he had to retrain as a doctor in Australia to the Sunrise show. Finally, here’s Munjed sharing the story of just one of the incredible patients whose life he’s changed – Marny Cringle who lost her leg when hit by a tube train in London and is now able to walk again. Look and listen out for more from Munjed in coming weeks, his is an incredible story and one we want to share with as many people as possible.